Between them, my supportive engineer, Crispin Thetford and Gregory Powell of http://www.poplargreg.com have made a present to me of a very special tax disc. 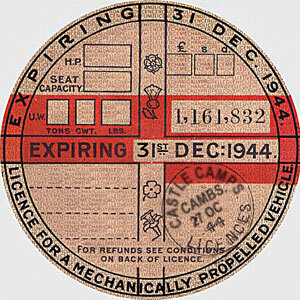 DVLA are no longer issuing tax discs, so there is no need to have one on the car. As Crispin writes, “It is quite legal however to display anything one wishes…including an out of date paper disc: this one is exactly how Chattie’s paper disc wouldhave looked if she had been taxed at the Post Office in Castle Camps on 27th October 1944.” Wonderful. My grateful thanks to Pin for thinking of it, and to Gregory Powell, who had already decided to donate something like this when he read about my Where They Served tour in the Hereford Times last week. I’m highly touched and chuffed! Have a look at Gregory’s website to see the fascinating options available for your vintage or classic car! I drove the thirty or so miles back from Malvern’s militaria convention yesterday evening; the first really substantial drive I’ve ever had in Chattie, and certainly the first such drive since getting her back from Thetford Motor Engineering after her thorough overhaul. What a drive! What fun! She handles beautifully, brakes on request, starts without a murmur, and I’m now getting the hang of it all: the gear double-declutch shifts, starting after only a short while on choke (a couple of minutes only on choke, then catching with the throttle when I push it in, after which she ticks over obediently, waiting…), the understanding of where she’s happiest, and knowing when the car is telling me a gear change is needed, rather than me telling her where I think it ought to be – which means we are not having so many arguments about it! To top it all, the sun set on my westward way home, providing me with at least half an hour’s free drive-through movie. You’ll be relieved to learn that I pulled into a lay-by to share this view with you. The Where They Served tour? Bring it on! 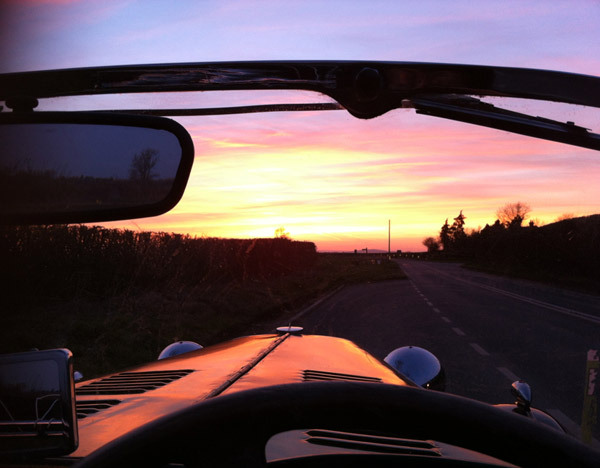 Chattie’s engineer, Crispin Thetford, of Thetford Motor Engineering, near Malvern, will be with Chattie and me at Brightwell’s on the viewing day for the Spring classic vehicle auction, Tuesday 3rd March. He is extremely knowledgeable about vintage and classic vehicles and from my point of view it will be fantastic to have him on hand so that he can field all the technical questions that are bound to be asked. Pin has been working on Chattie over the past few months, to prepare her for the tour ahead, so he knows her – literally – inside and out. If you are planning to be there, do come over and say hello to one or other of us. In Pin’s words, Chattie is now driving as she should; he’s the one who knows what lies behind that statement; I’m the one who will soon be finding out how great a driving experience that will give me over the next six months. Ready to roll – ready to stop?!!! Ground Control has fixed the brakes – he hopes. And so do I. He has put Chattie through a test-run and now it’s my turn to take her down the steep hill in the morning en route to the Shobdon Food and Flying Festival. If you see me there in one piece, you’ll know it’s all worked. For now, you can see I’m smiling!